UU’s Robbie Guerrero (pictured) hit a home run on Wednesday against visting Cedarville. Urbana University junior Robbie Guerrero and freshman Briley Harlan of Triad both homered to lead the Blue Knights past Cedarville, 8-7, on Wednesday at Blue Knight Field. UU improved to 2-12 overall and returns to conference action this weekend. Cedarville dropped to 6-10 on the season. 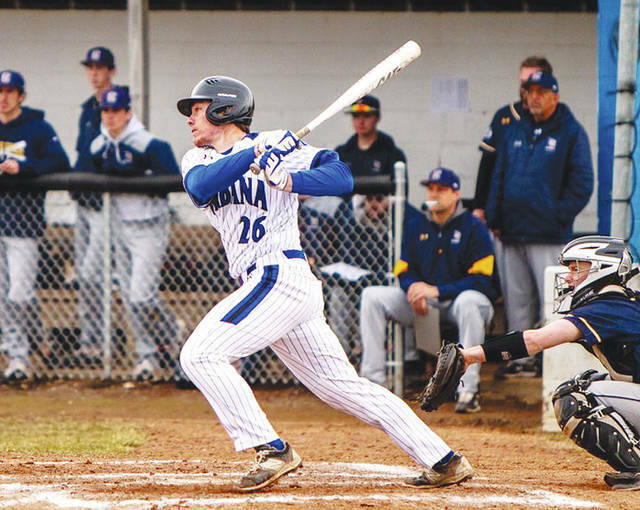 After losing three straight games decided by two runs or less, the Blue Knights did damage early on Wednesday with seven runs in the first two innings and held on the rest of the way. Redshirt-freshman shortstop Griffin Stevens went 2 for 2 with an RBI double and reached base five times while Harlan went 2 for 4 including his first career home run. Also leading the way were freshman third baseman Tyler Dellerman (1-4, 2B, 3 RBI) and Guerrero (1-5, HR, 3 RBI). Junior center fielder Chase Carney and senior first baseman Austin Pratt also recorded a base knock, as the Blue Knights outhit the Yellow Jackets, 8-7. Dellerman plated three runs in the first on a bases-clearing double for a 3-0 lead. After Cedarville responded with two runs, UU came back with four more in the bottom of the second. Stevens recorded a two-out RBI double and Carney singled then moved to second to put two runners in scoring position. That set up Guerrero’s clutch three-run blast, the first home run of his career, over the left-field fence to put UU ahead 7-2. The Yellow Jackets made it interesting with two runs in the fourth before Harlan’s solo blast made it 8-4. Cedarville then tacked on two in the sixth and one in the seventh. However, the Blue Knights stepped up on defense and got solid relief efforts out of Brett Bell and Guerrero to slam the door. Bell came on to finish the fourth and tossed 3.1 innings to earn his first victory. The freshman southpaw surrendered three unearned runs on three hits. Then, Guerrero took over in the eighth and did not allow a hit over the final two frames for his eighth career save. Sophomore Ryan Townsend made his first career start on the mound, logging a career-high 3.2 innings of work. He nearly escaped the fourth inning, but a soft grounder up the middle scored two runs with two outs to prompt a pitching change. Townsend allowed three earned runs on four hits, four walks and three strikeouts. UU heads south for an MEC doubleheader at Concord on Saturday and another twinbill Sunday at UVa-Wise. https://www.urbanacitizen.com/wp-content/uploads/sites/36/2019/03/web1_uubase.jpgUU’s Robbie Guerrero (pictured) hit a home run on Wednesday against visting Cedarville.